Established in 1972, Morsettitalia has progressively developed a complete range of Din Rail mounted Terminal Blocks both traditional screw version and new screwless version, besides a comprehensive catalogue of Printed Circuit Board Terminal Blocks, a complete marking system and a family of relays and signal converters. 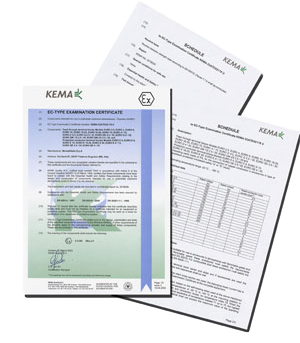 All our products have been Certified by many of the leading international approval authorities (VDE, UL, CSA, RINA). The exponential growth we have experienced over the past 10 years has mainly been determined by the considerable success our products have achieved on international markets. 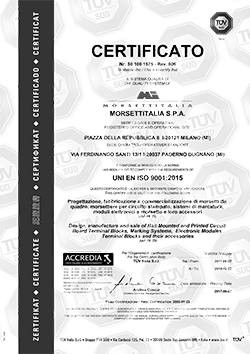 The UNI EN ISO 9001 approval certificate achievement as well as a new company structure combined with the high quality of our customer service, are factors that make MI the perfect supplier for electrical fitters, electrical switch board makers, machine makers and electrical and electronics industries. The production of a full range has allowed the inclusion in our new catalogue of a number of new products characterized by their high quality standard and a very competitive price. Terminal blocks are the simplest components in an electric system, but not the less important ones. Morsettitalia Spa offers today a range of products that is the result of accurate research, innovation and thirty years of experience. Established in 1972 as representative of a terminal blocks producer, since 80’s has progressively developed its own range of products. In June, 2000,MI moved in its new facility nearby Milano with General Management, offices and logistics. Morsettitalia today offers a complete range of Din Rail mounted Terminal Blocks both traditional screw version and new screwless version, besides a comprehensive catalogue of Printed Circuit Board Terminal Blocks, a complete marking system and a family of relays and signal converters. • Tertiary field (division and connection of distribution panels).